These delicious Pilgrim Hat Cookies will look so festive at your Thanksgiving dinner table! Also, they are perfect for kids to help make! Thanksgiving is a time to be thankful for so much in our lives…one of the things I am most thankful for is for the gift of my children. I know how lucky I am to have two beautiful kids that brighten my days and make life so much fun. So, I feel like we should have something fun for them at the Thanksgiving Day dinner table. 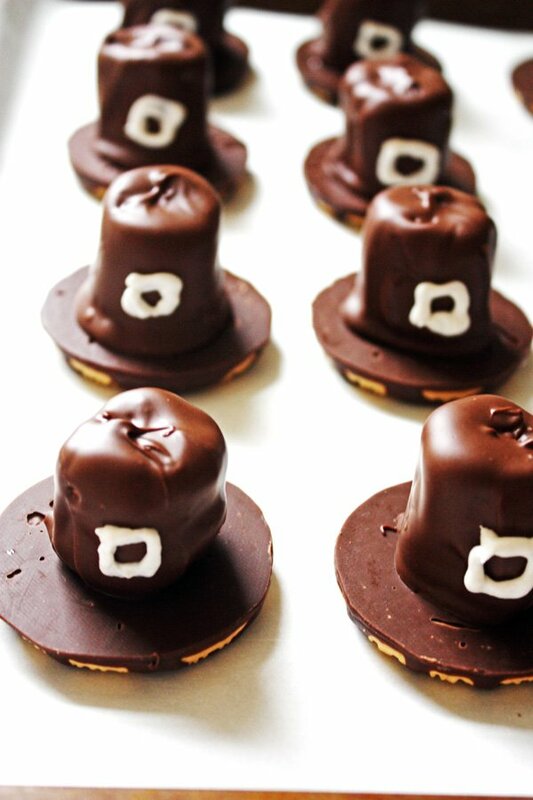 These Pilgrim Hat Cookies are just that! They will not only look like a fun treat, but will taste so yummy! They are pretty quick and easy to make too…which is good if you are cooking the Thanksgiving dinner. Actually in my opinion, it’s a good thing either way to have a quick and easy recipe! That makes for more family time. It is also a kid friendly recipe so if you have kids that like to help in the kitchen, this is one that they can help with. So let’s get started. Before you melt your chocolate, cover your baking sheet with parchment paper or foil. Place the cookies individually with the chocolate side up on the baking sheet. Melt the chocolate chips in either the microwave or in a medium pot on the stovetop. If melting the chocolate in the microwave, pour the chocolate chips into a microwave safe bowl. Heat them for 45 seconds and stir. If they are not completely melted then heat at 15 second increments, stirring after each one, until the chocolate chips are all melted. 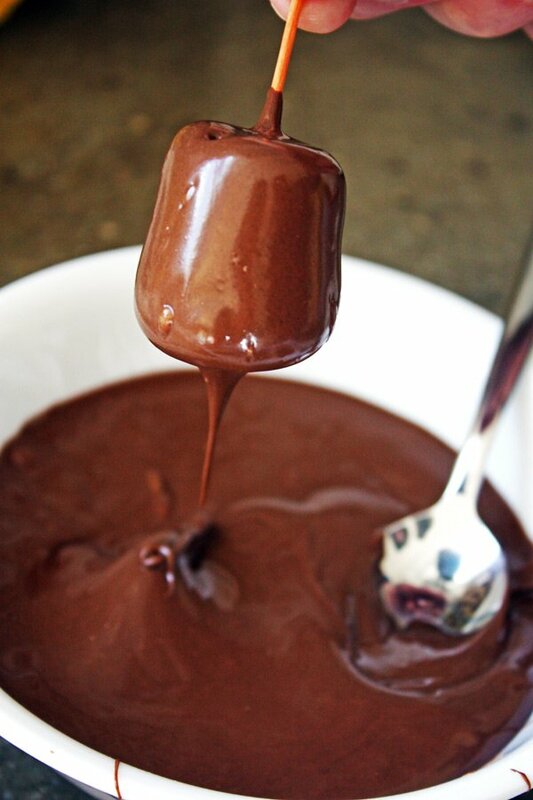 If melting the chocolate on the stovetop, pour the chocolate chips into a medium sized pot. Heat the chocolate chips on low to medium heat, stirring often, until the chocolate chips are melted. Make sure you watch the chocolate chips so they don’t overheat. Overheated chocolate gets clumpy and will not work. Watch the chocolate as it heats. Let it melt until there are still a small amount of chocolate chips still in there and stir the chocolate. The melted chocolate chips should be smooth and creamy. 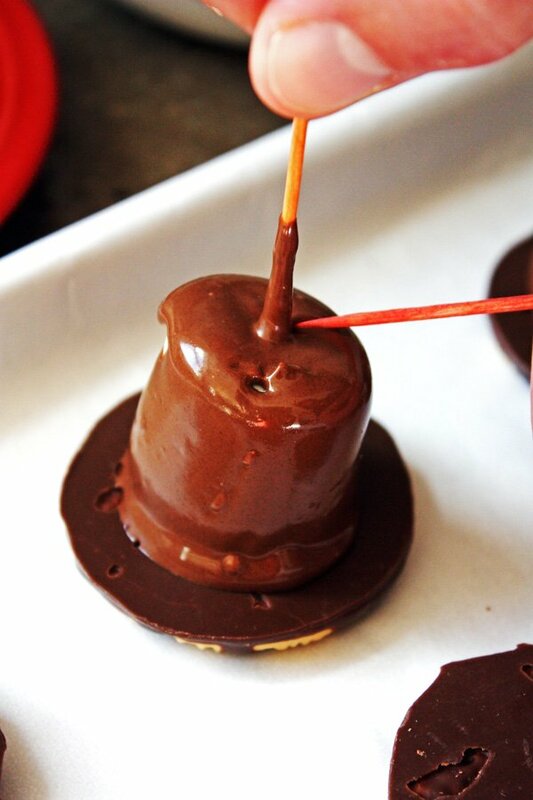 Next, insert a toothpick at the top of the marshmallow and dip the marshmallow in the melted chocolate. Dip it in there until the entire marshmallow is covered with the chocolate. Quickly place the marshmallow onto the cookie. Gently press the marshmallow down onto the cookie. Using the side of another toothpick to hold down the marshmallow, quickly release the original toothpick. This step keeps fingers off the chocolate! You can also use the toothpick to smooth out the chocolate on top of the marshmallow if needed. Chill them in the fridge for about 30 minutes or until the chocolate sets. Using the white or yellow decorators gel, draw a buckle on each hat. And that’s it! I hope you and your beautiful kids enjoy this yummy Thanksgiving treat. Your kids will have fun making them and also feel so proud of themselves as they helped make dessert for Thanksgiving! And you know what holiday is next…Christmas. Another fun recipe to make with kids are these Rice Krispie Treat Christmas Trees. I made them last year with my daughter and she loved making them…and of course, eating them! Have a wonderful Thanksgiving! I am very thankful that you stopped by! 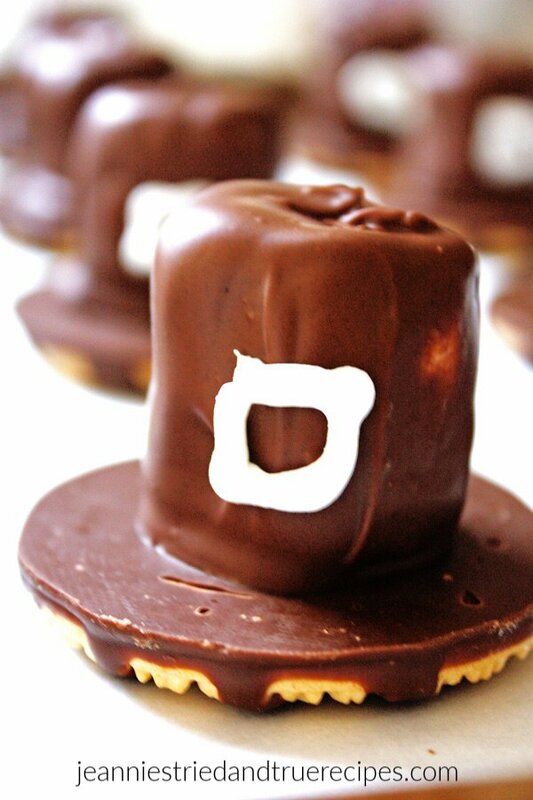 These delicious Pilgrim Hat Cookies will look so festive on your Thanksgiving table! Place cookies on to the baking sheet individually with the chocolate side facing up. Melt the chocolate chips in either the microwave or in a medium sized pot on the stove top. 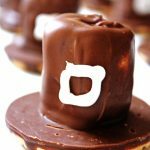 Insert a toothpick into the top of each marshmallow and dip into the melted chocolate until the entire marshmallow is covered with chocolate. 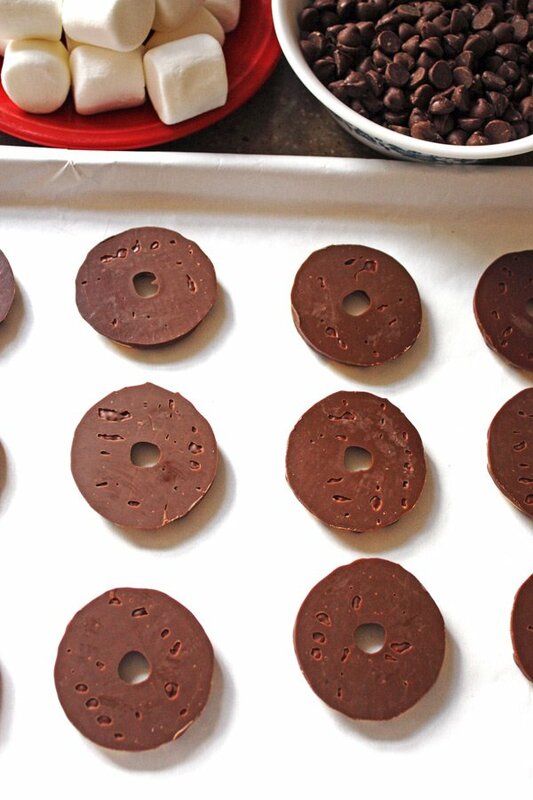 Quickly place a chocolate covered marshmallow onto a cookie and gently press down. Using the side of another toothpick to hold down the marshmallow, take out the other toothpick once the marshmallow is on the cookie. Once you have all the hats done, place them in the refrigerator to chill for about 30 minutes. 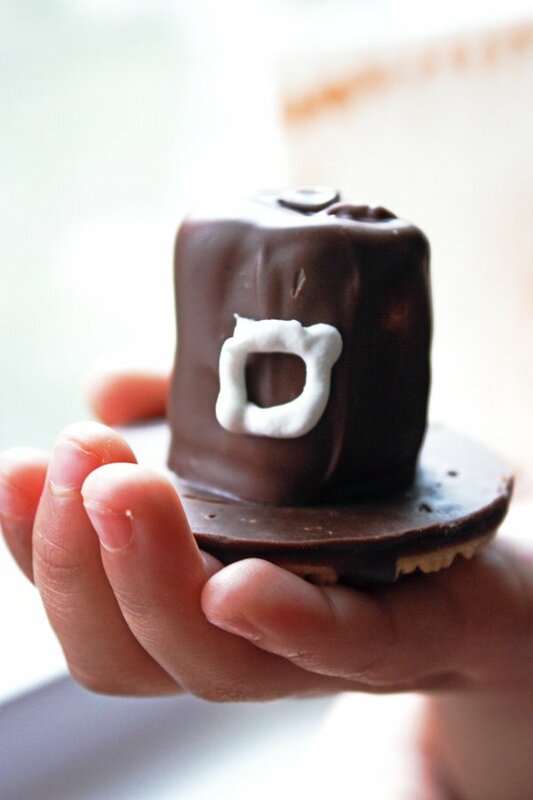 Take the hats out of the refrigerator once the chocolate has set and using the decorative icing, draw a buckle onto each hat. Put the chocolate chips in a microwave safe bowl and heat for 45 seconds and stir. If more time is needed to melt the chocolate, do 15 second increments, stirring after each one, until the chocolate chips are completely melted. Pour the chocolate chips into a medium sized pot and heat on low to medium heat. Stir often until chocolate chips are completely melted. Very festive! I love chocolate and marshmallows, so these have got to be delicious!! !